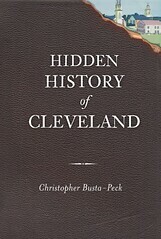 Many of the structures I've argued for have been in the city of Cleveland and inner-ring suburbs. These are the neighborhoods I'm most familar with and are where advocacy is most needed. 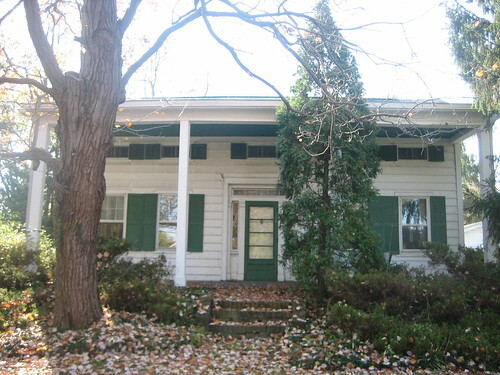 Today, however, I'll share one in very different surroundings - 3514 East Pleasant Valley Road, in Seven Hills, Ohio. The house, built circa 1850, is listed for sale for $64,900 - dangerously close to, if not less than, the value of the lot as vacant land. It was brought to my attention by reader Laura Howard, who was kind enough to share her photographs of the structure. 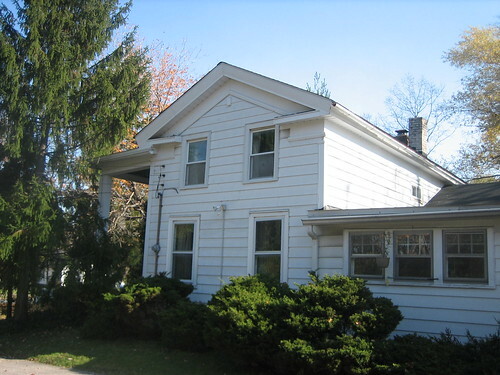 The basic form of the house, a 1 1/2 story block, is hidden by landscaping, an inappropriate later porch, and aluminum siding - all of which could be easily removed. House, East of Shalersville, Ohio. 1926. Used courtesy of the I.T. Frary Audiovisual Collection at the Ohio Historical Society. 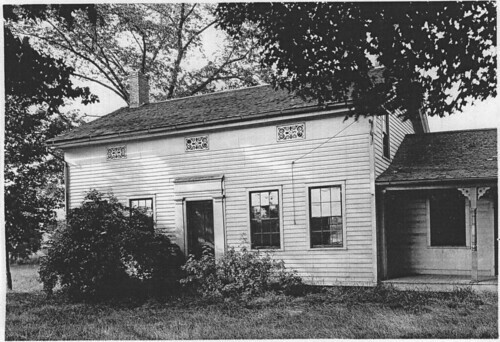 This house, located east of Shalersville, Ohio, helps illustrate the historic appearance of our subject house. The only major difference is that the house on Pleasant Valley has a larger, more ornate, doorway. As seen from one side of the main part of the house, it becomes obvious how (visually) tacked on the front porch is. On the opposite end of the house, a closer view of the gable reveals more intricate work than one ususally sees done with aluminum siding. This suggests similarly proportioned, more finely detailed, trim underneath. 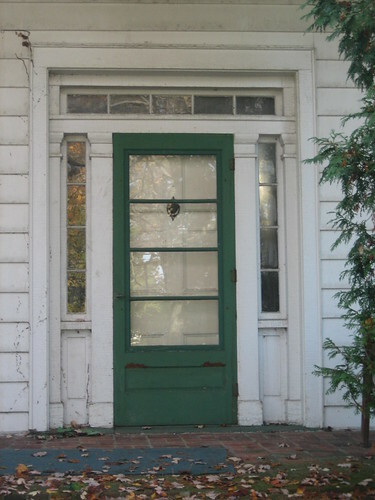 Inside, the detail of the front door, which is original, is more readily visible than it was outside. 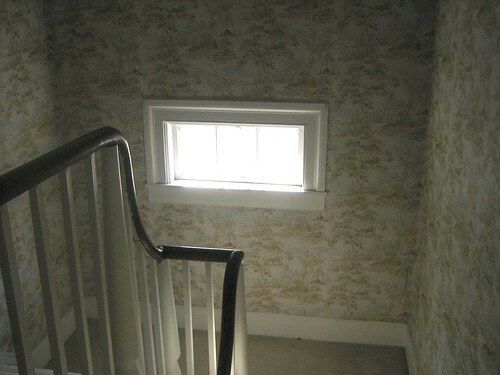 Also visible in the railing, for the stairs to the second floor, and a banister. The railing has a rather nice form, as seen here, from the second floor. 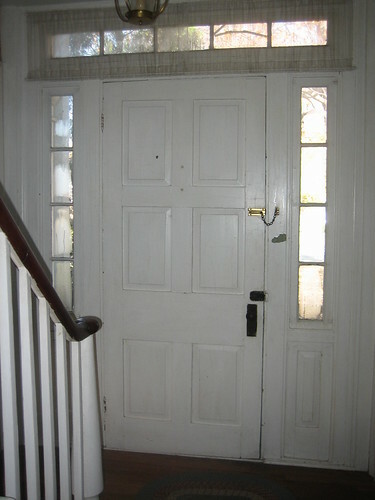 Other than an original door or two, that's the extent of the original trim in the house. 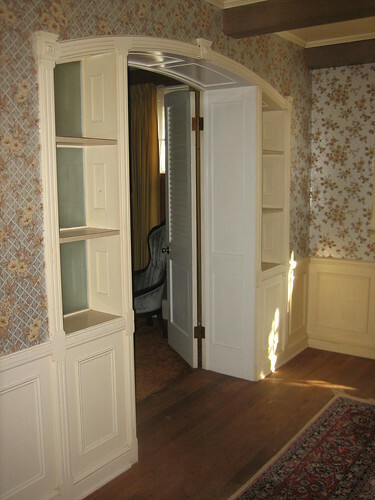 There is a rather nice arched doorway on one side of the dining room, probably installed in the 1920s. This house was probably moved to this site at an unknown date. The 1858 Hopkins Map of Cuyahoga County shows the parcel the house was on, 193 acres, as being owned by one J. Leonard but the only structure on the parcel was on another road. By 1903, the parcel the house was on had reduced to 91 and 3/4 acres, as shown in the Maps of Cuyahoga County Outside of Cleveland. The land, owned by, J. Packard, did include a house on Pleasant Valley Road - but not in or near the location of this structure. The house was therefore moved here after that date. The foundation. Laura Howard's photographs reveal a basement with walls that are buckling. She noted that there are significant humidity issues inside - the structure will definitely need intensive dehumidification issues, in addition to the foundation work. The idea of having to install some sort of bracing in the basement doesn't bother me much. Why? 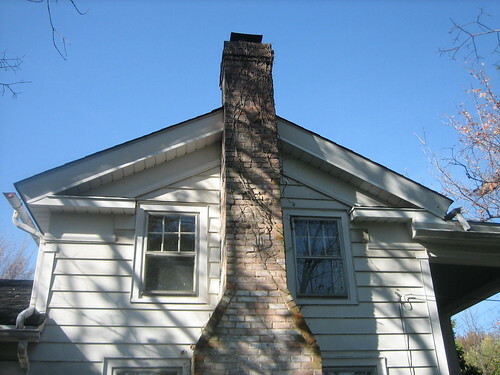 Because most of the basements in these houses are so short that they're of limited use at best. While we don't know where the house came from, we can be sure that the original location wasn't far away - while it may not be original to the site, the house is part of the original fabric of this community. Underneath the landscaping, the porch, and the aluminum siding, there's a beautiful little house, worthy of someone's attention.